Toyota heads into the upcoming Tokyo Auto Salon with a dressed up version of its large sedan, the Crown Modellista which will be a Japan-only model. The car is based on the Toyota Crown Concept, which was displayed at the Tokyo Motor Show in October this year, previews the fifteenth generation of the model. 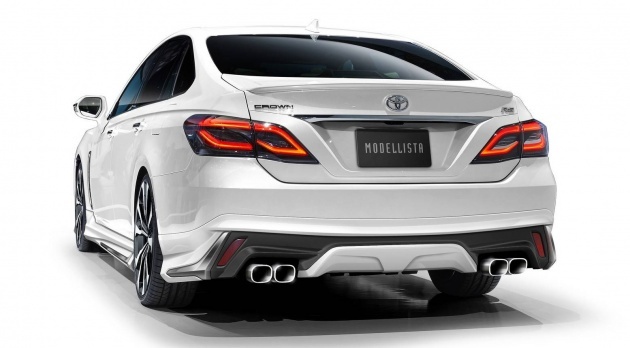 The Modellista kit builds upon the Crown’s exterior, adding more chrome accents around the front bumper which is also home to a new spoiler lip. Along the sides, the front fenders appear to have air-moving elements, while the side skirts are visually more substantial items. There’s also additional metallic trim on the side mirror covers as well as a new wheel design. The rear bumper houses exhaust exits which are now square instead of rounded units, with revised housings, bookending a new diffuser look. Meanwhile, no changes under the skin are listed, which means that the eventual production car will start with the base 2.0 litre turbocharged petrol which cranks out 235 PS and 350 Nm of torque paired to an eight-speed auto; a 3.5 litre NA V6 petrol is also expected, with a 10-speed automatic. A hybrid powertrain version is likely to adopt the Multi Stage Hybrid System V6 with twin electric motors for a total system output of 354 hp, paired with a four-speed transmission which works with the electric motors so simulate the feel of a 10-speed transmission. To recap the new Crown’s equipment list, it will include autonomous emergency braking along with vehicle-to-infrastructure (V2I) and vehicle-to-vehicle (V2V) communication. Data communication modules for connectivity to the Internet of Things (IoT) will come as standard. The new, fifteenth-generation Toyota Crown is set to go on sale in its native Japan in the summer of 2018, with the Modellista version here set to make its public appearance at the Tokyo Auto Salon next month. Best tech & refinement specially for Japan-only models. Banzai Daihatsu! Toyota’s iconic always the king of kings!